Im having the same issue. Did you figure out how to resolve this? 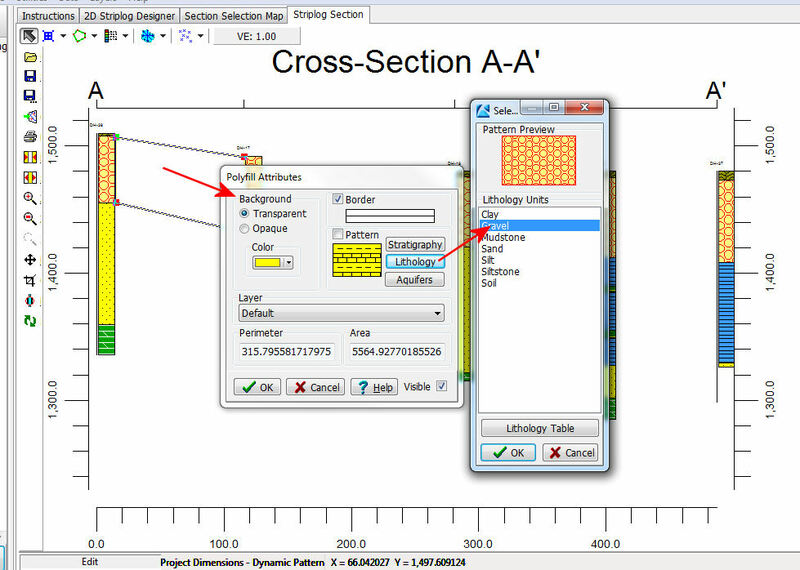 Use the Borehole Manager Lithology | Section menu command to create a lithology model and draw a modeled cross-section. P.S. Diego: I'll take a look at your files that you sent by e-mail and respond separately to your e-mail question. If you have Stratigraphy data, you can create simple, straight-line correlation panels between like units in adjacent holes using the Stratigraphy | Section | Straight menu option. If you have Lithology data, it's best to interpolate a 3D model through which you'll create a series of slices to create the cross section, as Tom noted. (You might want to go through the lithology portion of the tutorial to practice and understand the concepts of lithology modeling and diagram creation.) However, if you don't want to go that route, you can conceivably create a striplog-only section, then use the RockPlot2D drawing tools (Draw | Line Types | Polygon) to draw correlation panels. You can even link the pattern in the polygon shape to a specific lithology type.